Dhaka, Jan 4 (Just News): New Social Welfare Minister Rashed Khan Menon today said the next parliamentary elections will be different and difficult than the previous ones as “all political parties including BNP are likely to join it”. Menon, also president of the Workers Party, said this while addressing a press conference at Jatiya Press Club this morning. The minister came up with the remark, two days after BNP Chairperson Khaleda Zia categorically said her party would contest the national elections but the polls must be held under an interim non-partisan administration. Meanwhile, in reply to a query on his transfer to another ministry, Menon said he ran the civil aviation and tourism ministry successfully. Yesterday, Menon was transferred to social welfare ministry from civil aviation and tourism, a decision of which he had no clue until an official announcement. The next parliamentary election is expected to take place in late 2018. Without mentioning Awami League name, Menon also said that it would be suicidal if anyone in the AL-led 14-party grand alliance takes go alone policy regarding the next election. He announced a 21-point programme as part of his party’s plan for the country’s different sectors including road, transport, communication, agriculture and education etc. 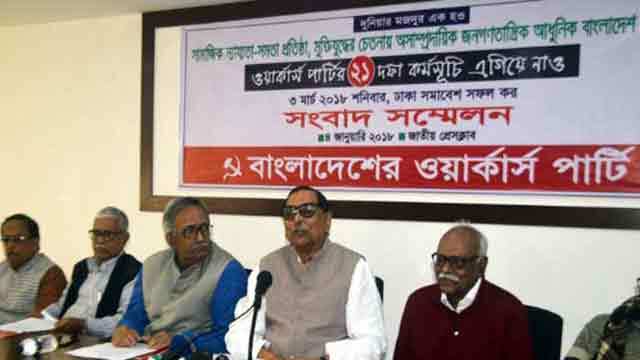 Workers Party will hold a rally at the Suhrawardy Udyan on February 3, he said.